Resumes list our accomplishments and highlight our skills. Where do we state that we are willing to work 12 hour days? What part of the resume lists that we are willing to log back in and work more as soon as we get home from the office? Did you mention “willing to work weekends and ignore your family” under Hobbies? Of course not! Then why do so many of this fall into this trap? Somewhere, someone led us to believe that we are paid for our stamina – working long hours means future success. Well, it doesn’t. As a matter of fact studies show that the less sleep we have, the less productive, creative and effective we are, at work and at home. The number one reason I hear women AND men say that they don’t delegate is because they can do it better themselves. In all of the leadership programs I have led, this comes up time and time again, without fail. I will tell you what I tell them: Stop thinking you can do it better than anyone else. If you keep doing the jobs yourself, you will remain in this position for the rest of your career. And if for some reason, it is actually true that you can do it better than anyone else, you are in the worst shape of all, because you have surrounded yourself with a team that is not going to lift you up – they are only going to bring you down. What will you be able to achieve for yourself and your organization if you start to delegate? Hire People Smarter than you! Surround yourself with smart and talented people, who will help you executive and deliver your initiatives. You will learn more, achieve more, and get ahead faster by building a team that helps everyone succeed. Why are you hiring people who know as much as or less than you? Do this with people inside of your organization. You will be more successful when you are able to work with others and through others. You cannot influence people you don’t know. And if you can’t influence people, then you will never make it into a senior leadership position. Influence is the key skill leaders at the top have mastered. What would you be able to achieve if you strengthened relationships with your colleagues? What doesn’t get prioritized doesn’t get done. We need to recharge to be effective in the office and at home. Don’t think you can go 24/7 and still be happy, enthusiastic, joyful and helpful to others. Get at least 7-8 hours of sleep or else you will create negative effects on your body and health. What do you have to do differently to get to bed earlier? 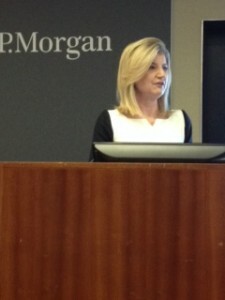 I heard Arianna Huffington speak this morning in NYC. She had me laughing out loud when she said “No one is going to read your Linkedin Profile as your eulogy.” Mary was able to increase sales by 58%…. Not going to happen! So let’s be GREAT at what we do, without killing ourselves. Create the life you want today. If not now, when?